Hearn Monument provides sandblasting service in-house and on-site. We have the ability to sandblast many diffeerent types of materials including wood, glass, concrete, stone and metal. We have sandblasted prodcuts shuch as, auto parts, patio furniture, mower decks, motorcycle parts, antiques, car frames, signs, pots, concrete floors, brick and rock walls. There is no job to small or to large for Hearn Monument when it comes to sandblasting. After sandblasting, your part or material will be ready for primer and a new coat of paint. 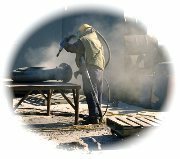 Some materials are not sutable for sandblasting and we may recommend another technique for prepairing your surface. Please contact one of our representives for more information.